Dermoscopy is a diagnostic technique which allows greater visualisation of structures in the skin which are otherwise invisible to the naked eye. The rough surface of the stratum corneum scatters light reducing detail seen of the underlying structures. Dermoscopy overcomes this surface light scatter by either using contact with an interface medium or by using cross-polarised light. There are three main types of dermoscopy devices, contact oil immersion (non-polarised) devices; cross-polarised devices; hybrid devices combining both polarised and non-polarised modes. These devices are the most established devices with a long history of use. An interface medium is required to overcome the surface light scatter, making these devices slow to use, messy and a potential for cross contamination. There are a variety of devices available, with variable illumination with either halogen or LED bulbs, optical lenses or power source, battery life / rechargability etc. The contact device with the best overall features, in my opinion, is the Heine Delta 20. The development of polarised devices for dermoscopy at the start of the 21st century regenerated interest in dermoscopy. At last devices were able to overcome the surface light scatter without the need to apply copious amounts of interface fluid on the individual. This allowed many lesions to be examined quickly without the need for naked eye pre-selection. Since the earliest polarised devices were launched advances in imaging technology have now overcome the initial drawbacks making these devices now the standard for many dermatologists. 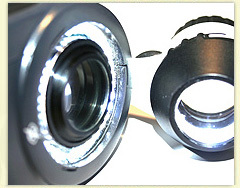 Hybrid devices can combine both polarised and non-polarised modes for imaging. The first hybrid device, DermLite Hybrid, combined LED technology for a contact non-polarised mode as well as LEDs for polarised imaging. However is was a compromise as the LED source was split over the two imaging modes making is inferior to the Heine Delta 20 in non-polarised mode and inferior to the DermLite Pro II HR in polarised mode. Nonetheless a great advance in technology. However the launch of the DermLite DL3 has produced a truly versatile dermoscopy device with excellent imaging quality in both modes, comparible to the best non-polarised device and the best polarised device. Which dermatoscope is the best? The choice will depend on a number of factors, the best way is to get familiar with a range of devices before you buy. For more information on dermatoscopes see: Which dermatoscope is best?